Kensington is a super elegant boot beautifully finished in a choice of black or brown patent leather both with a choice of snake or crocodile patterned finish as well as a grey mock croc. Gorgeous patent leather. As standard black and grey versions have a red pig-skin lining and brown use chocolate pig skin for ultimate comfort, luxury and style. Reply to order confirmation if you would like a different combonation. Photos show black mock croc in both a wide cal as well as one slim calf example. The adjustable strap means Kensington is adaptable, a boot that looks fabulous with jeans or a skirt. The foot profile is slim and particularly elegant. 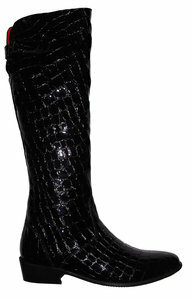 The sole unit has a low profile in keeping with the elegant shape of the boot and has a built in grip pattern. Our only patent leather style available in foot size 43.